For 15 years, I was the webmaster for the World Watusi Association (WWA), a non-profit organization dedicated to the promotion of African Ankole-Watusi cattle. 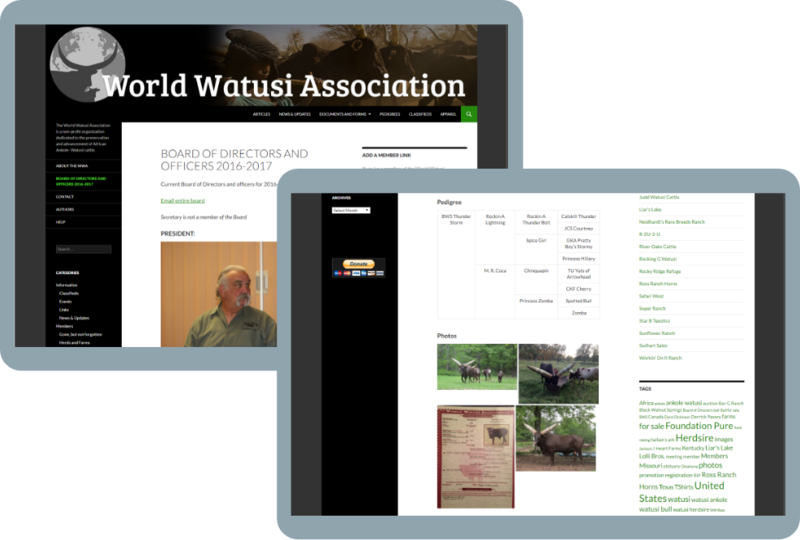 The WWA is made of Ankole-Watusi ranchers and enthusiasts, and the website serves as an information hub for both members and non-members. 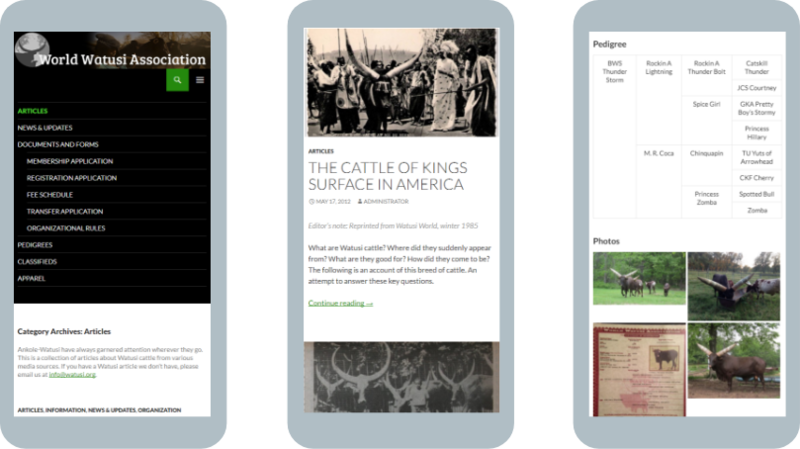 In 1999, the WWA needed a web presence to help the organization connect with both members and potential members who were geographically located all over the world, as well as promote the Ankole-Watusi cattle breed. This website needed to include membership information, breed information, and some way for members and others designated by the organization to manage content. Moreover, all services would have to be free or donated, as the organization is a non-profit and on a very limited budget. Membership dues and animal registration fees accounted for the majority of income for the organization, with donations being practically non-existent. Printing costs were increasing, and limited organization events throughout the year meant little opportunity outside of word of mouth to reach potential members, hence a dwindling organzational budget. The Internet, then in its infancy, was seen by the WWA Board of Directors as a vast and inexpensive way to promote both the breed and the organization, and hopefully increase both memberships and donations. As the website matured, the challenges moved towards more responsive design, and designs that appeal to more users. The website was redesigned several times, each time giving more and more thought to addressing what users needed from the website: responsive design, the ability to download documentation, editable PDF documents, pedigrees, and members only areas. Unfortunately, not all businesses offer discounts for non-profits, or only offer discounts to certain types or those in certain sectors, so finding quality services for affordable prices was a constant struggle. When first looking for a publishing platform and content management system (CMS) 2000, I turned to WordPress as a first choice; it turned out to be the last, and it is still runs the backend of the WWA website today. WordPress has scaled up excellently with the WWA’s needs and its extensible nature means that the organization is never far from being able to implement whatever new feature they need. Even moving from hosting platform to hosting platform with WordPress has been relatively simple. It’s also free and open source, which means that the code for the platform is developed openly and anyone can contribute or audit the codebase. Web hosting - I provided the domain name, hosting, and technical administration of both. Technical administration - I maintained the WordPress, web server, and email server. Website maintenance - I donated content, technical, social and SEO maintenance. I was responsible for posting informative content about the Ankole-Watusi breed on the website and distributing that content among various channels. I maintained the WWA’s social networks including both Facebook and Twitter, and maintained SEO best practices both in the content and in the framework to ensure high rankings and increased website traffic.